Presenting the launch of vessel drydocking services in the Mediterranean region, Multimarine Shipyards successfully held the “Multimarine Shipyards Middle East Forum” in Beirut. The Forum included maritime industry leaders from Lebanon and Syria, with the aim to present the capabilities of the company’s new shipyard located in the port of Limassol, Cyprus. Organized by Robban Assafina, the MENA Maritime Shipping, Ships, Offshore & Marine Technology Magazine, the “Multimarine Shipyards Middle East Forum” came in line with the company’s efforts to present its leading services in the maritime, ship repair and oil and gas sectors, mainly in the Middle East. Major Lebanese and Syrian maritime shipping companies, shipowners, ship management companies and leading maritime specialists attended the forum to get introduced to the new company. Through this forum, Multimarine Shipyards, stressed its commitment to providing its diverse and integrated services to its local and international customers, mainly ship repairs and maintenance for various types of vessels: bulk carriers, oil tankers, container ships, offshore support vessels, LNG carriers and mega yachts. Multimarine Shipyards also confirmed its position in providing mechanical and civil construction, fabrication of steel structures and plant maintenance services on onshore power plants, fuel storage terminals and process plants. The attendees praised the importance of this forum, which introduced a new ship repairing company in the Middle East and its most prominent services that directly concern them. Based on the importance and quality of shipowners and ship operators/managers, as well as marine services available in the Middle East, Multimarine Shipyards had to show its superior potentials and services that will surely benefit the industry leaders and their ships sailing around the world. So this forum is considered as a gateway to cooperation with companies eager to know more about our services, and hold private meetings for future commercial deals. Regarding our business, we appreciate the importance of the Middle East region that we look up to with big expectations. In addition, the company’s strategic location means a lot when it comes to saving fuel costs, as well as offering good quality services. Multimarine Shipyards is a provider of specialized services to the Marine and Oil & Gas Industries in the Eastern Mediterranean and is located inside the Limassol Port. Since 2001 Multimarine has achieved exemplary performance and seamless executed challenging projects in Cyprus & Egypt. The company has a track record for safe and efficient execution based on experienced management where client satisfaction is always its key focus. The introduction of vessel dry-docking services in Cyprus complements Multimarine’s existing service portfolio in the Marine and Oil & Gas Industries and is part of the Group’s strategy to offer a complete one-stop service to its local and international clients. 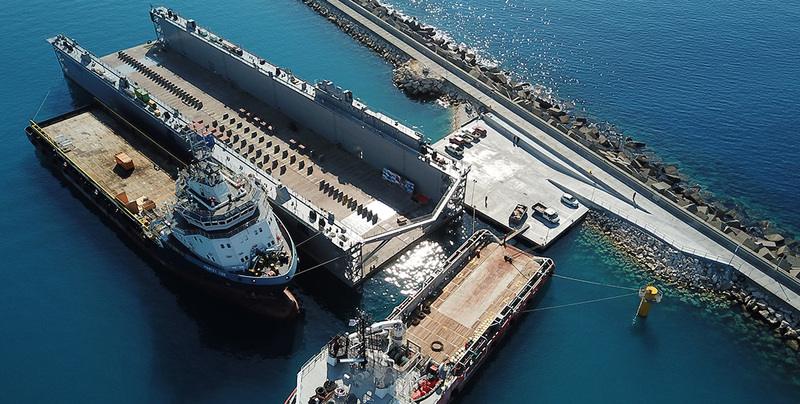 Multimarine Shipyards inaugurated the floating Dock ERENEOS this year on June 15, 2018. The floating dock can serve all types of vessels such as tankers, bunker vessels, container vessels, LPGs, yachts, bulk carriers, fishing vessels, navy vessels and offshore support vessels. Multimarine is expanding the current workshop with a second additional workshop dedicated only for vessel mechanical works. In addition, ABB Turbocharging will also be stationed in the new workshop as part of Multimarine’s intention to offer complete service to the shipowners trusting the yard for vessel maintenance services. Multimarine’s oil and gas service line has successfully performed some challenging projects including the maintenance and engineering services for more than 15 years, supporting exploration projects in Cyprus and Egypt in the Eastern Mediterranean region. Multimarine is considered unique with its ongoing efforts to develop a wide range of services applied to all multinational oil and gas companies with its onshore or offshore operations in the region.